Pumpkin Pie, Need I Say More? The season of spooktacular pumpkins is upon us, an October ritual that brings back so many family memories. When a friend of Sam’s visited for a week, she brought her own memories of making pumpkin pie with her father. So Tessa and Sam baked pumpkin pie last weekend. They walked over to the pumpkin patch at the Immanuel Church-on-the-Hill Church (“Buy a pumpkin, help the world”) and picked out a sugar pumpkin. They cut up the pumpkin and boiled it and then pulled out my tried and true, battered and splattered Betty Crocker’s Cookbook that my mother gave me when I was a teen. This is a basic pie recipe that I have prepared since I was 10. I am still drawn to this cookbook for nostalgia – whenever I use it, I think about my mom. There are no fancy recipes in it. Nothing like the fabulous pumpkin desserts that our friend Sandy bakes every Thanksgiving. Or the touch of genius that Laurie puts in her pumpkin pie — diced crystalized ginger. Just solid American cooking. It was fun watching Sam and Tessa cook together in the kitchen. It was quite a team production. The pie was delicious and a few days later we begged them to make another. As if on cue, the bottom heating element of the oven broke down. We concocted a plan to cook the pie using the broiler – we put the pie pan on the lowest rack, and turned the broiler on for 5 minutes, then off for 5 minutes. Pie turned out great. A cloud of whipped cream cured any small imperfections. Note: Cut a sugar pumpkin in half, scoop out the seeds. Place the halves cut-side down in a baking pan. Add 1 cup of water so the pumpkin doesn’t dry out. Bake at 350 for about an hour, or until a knife inserts easily. Cool, then scrape the pumpkin flesh and discard the skin. Puree pumpkin in a food processor until very smooth. Beat the eggs. Add the pumpkin. Then add the other ingredients and mix until smooth. Carefully pour the custard into a prepared 9-inch pie crust. Cover the edges of the pie crust with foil so they don’t burn. Bake at 425 degrees for 20 minutes, lower temp to 350 and bake another 40 minutes or until a knife inserted comes out clean. I grew up only vaguely aware of my heritage. Unlike some of my college friends who were raised in communities that were overwhelmingly German or Norwegian, my hometown was a mishmash of early 20th century European immigrants – German, Scandinavian, English, a smattering of Dutch. My father was 100 percent Swedish (though he and his brothers loved to tease us that Grandma was part Indian, which we believed for an unreasonable number of years). So I grew up eating Swedish meatballs with cream gravy, rice pudding, a fried dough called fattigmand, and sweet yeast rolls fragrant with cinnamon that replaced the cardamom traditional to Sweden. Lingonberries couldn’t be found in South Dakota, but berry jam was a good substitute. In 2006, CRR and I traveled to Sweden to check out my ancestral homeland. I didn’t really give the food much thought, given what I grew up with, until I started reading up for the trip. The guidebooks explained why pickled herring played such a prominent role in the salad bars of my youth, and the difference between salmon lox and gravlax. 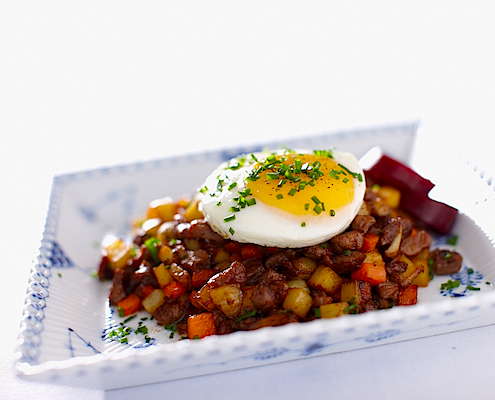 I became enamored of a dish with the whimsical name of pyttipanna, a hash with beets. When we arrived in Stockholm, we made a beeline for a restaurant specializing in pyttipanna in the cobblestoned old town district. I don’t remember what CRR ordered but I was besotted with … hash. I think the beets made the difference from an American hash, adding a natural sweetness that complemented the onion. So when I harvested a bunch of beets this week, memories of our Sweden trip flooded back and pyttipanna came to mind. It is a perfect supper or brunch dish. Saute diced onion in olive oil until translucent. Then add equal amounts of cooked diced potato, diced beet and diced meat (I used Italian sausage because I had some on hand; I have also used leftover beef and pork). Saute on mid-to-high heat until browned to taste. Season with salt and pepper. Place into bowls, top with poached or over-easy eggs that will run into the hash when broken. Close your eyes and dream of fjords and Vikings. I was weeding the garden (a never-ending task) when I heard the little critter: the unmistakable high-pitched whine of a mosquito. It was early morning and mosquitos are notorious at that hour in our garden plot. I looked at my exposed skin but didn’t see any skeeters settling in for breakfast. So back to work, silently cursing that I hadn’t spritzed myself with bug spray. The buzz was insistent, and I kept looking for mosquitos to no avail. Then, out of the corner of my eye, I saw something aloft about 50 yards away. It was a small drone, being flown by remote control by a man while his delighted young daughter chased it around. Curious, I walked over and asked him a few questions. It had a wing span of 38 inches, he said, and could hold a 5-pound camera. He bought it online, and uses it to take video for television ads. He was practicing with a new remote control. 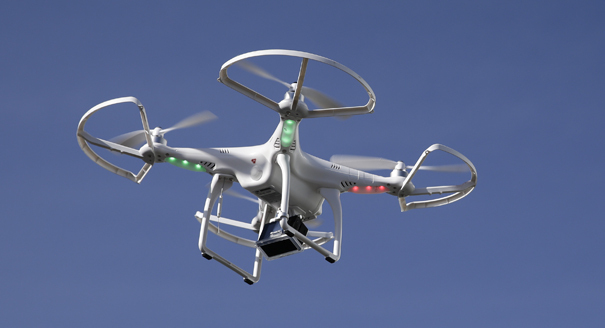 I found the drone online – it sells for $1,300. Amazing. I know drones are an exciting prospect for law enforcement and for commerce. The FAA has projected as many as 7,500 commercial drones may be in use by 2018, and the drone industry hypes that more than 100,000 drone-related jobs will be created in the next decade. What began as a weapon of war, costing taxpayers $90 million for each of the most sophisticated killer drones, has morphed into an airborne videocam with unlimited domestic potential. I suppose we should be grateful to the military industrial complex for its ingenuity. But I can’t help but worry that if a guy can buzz my garden plot with such ease, what could a criminal or terrorist pull off? If you lived in the Washington, D.C. area on June 29, 2012, you remember exactly where you were when the derecho steamrolled through. We’d never heard of the meteorological term until afterward. The National Weather Service had warned of severe thunderstorms, and I stood in the doorway mesmerized by the trees swaying and the rain pounding the patio with a fearsome backdrop of lightning. Then I heard a loud crack, and jumped back into the house. It was a transformer blowing, and so we joined 4 million people who lost power for days. One good thing came out of that storm. A fledgling craft brewery in Alexandria, Port City Brewing Company, lost power and thought its full tank of beer would go bad. Instead, the beer simply fermented at a higher temperature. Thus was born the Derecho Common beer. The brewery smartly marketed the beer as “the storm’s gift,” and just this weekend released the third annual Derecho beer. For you beer aficionados and home brewers (JJJ take note), here’s how Port City describes it: “Deep golden in color, and has toasty, biscuit malt flavors. It is medium bodies with an assertive hop profile. It is dry hopped with Amarillo hops, which give it a spicy, citrusy hop kick on the finish.” Alcohol 4.8 percent. It took us some time to find our way to Port City, which turns out to be practically in our back yard in Alexandria. 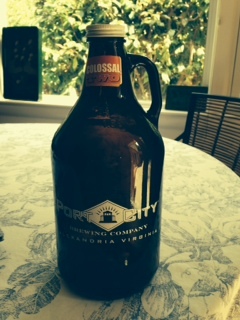 Sam got CRR a growler of Port City brew for Christmas, and we’ve been back several times since. Take the tour: for $10, you can schedule a tour of the backlot of the brewery and get five tickets for 6-ounce pours of their microbrews. My current favorite: Tartan ale, a hearty beer that falls between the lighter IPAs and the stouts. CRR recently came away with a growler filled with Colossal Two, a smoked imperial stout. “Hints of bacon”, for real! Port City’s fame is growing — Chef Geoff of the eponymous restaurant chain just commissioned a beer named Northwest — so go soon before the line is out the door. As we begin the 90-90 season in Washington (90 degrees, 90 percent humidity), it’s an appropriate time to introduce a refreshing drink from the Middle East. When I visited Sam in UAE, we toured an ancient neighborhood of Dubai. After several hours we were hot and sweaty and parched. He suggested a local drink, mint lemonade, as a sure pick-me-up. I wasn’t so sure, but readily agreed. Getting out of the sun was my priority. We sat silently in the late afternoon shade while the waitress slowly made her rounds and eventually produced our drinks. The mint lemonades in tall icy-cold glasses were curiously green. Herbaceously green. I took a sip. Mmm. It was so refreshing. The mint, the lemon, the ice all combined to create a drink that washed away the heat. After a few sips, we were alive again, talking, enthusiastic about our evening plans. Since we have an abundance of mint (ie, the worst winter in half a century didn’t make a dent in it), I decided to figure out why this drink was so restorative. Mint: astringent, antiseptic, antibacterial, antimicrobial, decongestant, expectorant, antiviral. Lemon: antibacterial, antiviral, immune-boosting, digestive aid, liver cleanser. I decided to give a home version of mint lemonade a try. I chose a warm Sunday when Chris and Jeff were visiting, after a walking tour of the super-cool Del Ray neighborhood of Alexandria. Pack a blender container with a handful or two of mint leaves. Add enough lemonade to cover. Whirl for a minute or two until the mint is pulverized. (This is no muddled julep!). 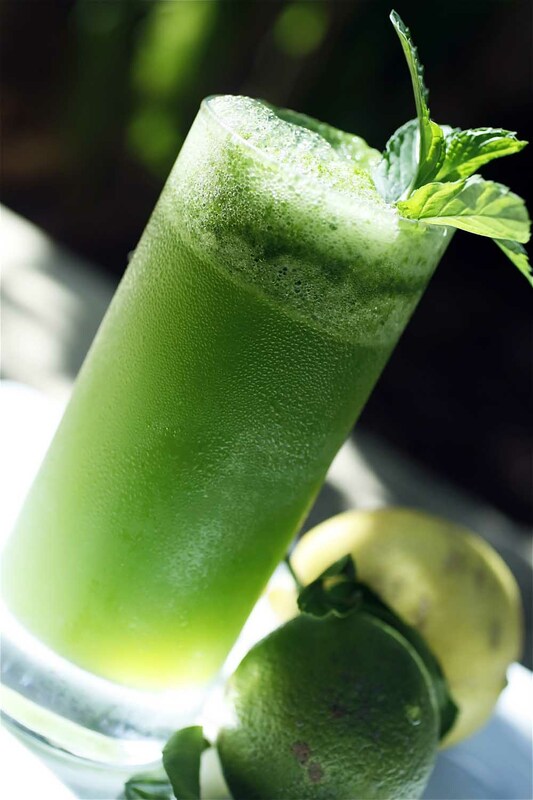 Spoon a teaspoon or two of the mint pulp into the bottom of a tall glass, add ice, fill with lemonade. Top with a twist of lemon. Serve with a straw, which you use to stir and sip. Ratio is the tricky part. CRR likes less mint puree; I like more. It’s a personal thing. You’ll have to find your bliss. The four of us sat on the patio, slowly sipped and felt the antibodies (see above) take effect. Jeffrey declared himself relaxed. You had to be there to believe it. If you troll Mideast foodie websites, some make the lemonade from scratch, others add a teaspoon of orange blossom water (which has a heavenly smell) or perhaps top it off with sparkling soda. Others whirl it into a frozen drink, and the racy ones suggest a splash of rum or vodka. After experimenting for several weeks, I think I’ll freeze some mint puree in ice cube trays. Then I’ll plop a mint cube into a glass of lemonade at the end of the languid summer nights to come. And dream of Arabian nights. When my eldest son was a baby, I would often tuck him into a stroller and walk through the quietude of Arlington National Cemetery. Last weekend, when Will was home for CRR’s significant birthday, we walked it again. It is a wondrous place – acres of rolling hills with ancient trees standing vigil over 300,000 graves of those who fought for their country. The first were buried exactly 150 years ago, in May 1864, in the throes of the Civil War. In bitter revenge for Robert E. Lee’s decision to lead the Confederate army, the Union seized his Arlington estate for unpaid taxes. The mansion, atop a hill that overlooks the capital across the Potomac River, would never again be home to the Lee family. Instead, its lush grounds became the final resting place for Union dead. No one was angrier at Lee than Gen. Montgomery Meigs, the Union Army quartermaster and a fellow West Pointer who had once served under Lee. It was Meigs who ordered the Lee property to become a cemetery, and it was Meigs who directed the first gravesites to border Mrs. Lee’s gardens. Meigs built the Tomb of the Unknown Soldier to house the remains of 2,111 unknown soldiers – Confederate and Union — from the Battle of Bull Run. And after the war Meigs chose his own gravesite, a stone’s throw from the Lee mansion. Nearby is Abner Doubleday, a Union general who did or didn’t invent baseball, depending on which account you believe. Closer to the Tomb of the Unknown Soldier, there is a section heavy with World War II luminaries. Gen. George Marshall, who steered the military through the war and then developed the European rehabilitation plan that carried his name. 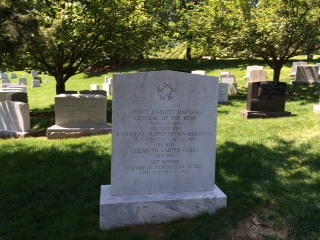 Behind Marshall lies Walter Bedell “Beetle” Smith, chief of staff to Gen. Dwight Eisenhower. A few sites over: Gen. Matthew Ridgway, commander of the airborne paratrooper assaults that helped win the war. And on and on. A walk through Arlington is to relive America’s hard-fought history, one soldier at a time. On Monday, the cemetery will be filled with tourists and VIPs and family members to commemorate their courage and sacrifice. On Tuesday, it will once again fall mostly silent. As we walked toward the exit, we passed seven soldiers at attention, a respectful distance from a family burying a loved one. A few minutes later, we heard the 21-gun salute, a last tribute. WASHINGTON – In the spring of 1965, when I was turning 11 years old, Jack Weinberg, a free-speech-movement activist and graduate student at the University of California-Berkeley, told a reporter that young people should not trust anyone over 30. I’m turning 30 times two tomorrow, smack dab in the middle of the Baby Boomer generation. How ironic that seminal line of the Boomer/60’s generation looks from this vantage point. Had Weinberg uttered those lines today, it would fire up what we now call a viral event, going global with the Speed of Tweet. Something new to argue about. The generational experts would come out swinging, Xers vs. Boomers, Millenials proclaiming their independence from it all. Partisans would look for a quip or attack line to win the moment. The phrase would be hash-tagged into infinity, hashed over into exhaustion on the cable talk shows. The line would be no wiser today than it was in 1965. The generation that came of age scarred by Vietnam, embroiled in the Civil Rights movement, catered to and obsessed upon in the culture like no other, is easing into retirement leaving the country deep in debt, and with a political trust deficit just as deep. It’s not all the Boomers’ fault, but a lot of it has happened since we turned 30. And as if to remind Boomers of the often petty natures of our disagreements, Tom Brokaw re-introduced us to the Greatest Generation. Now, in their twilight, these old soldiers come to the World War II Memorial here, wielding canes instead of guns this time, offering a more quiet contemplation of their own sacrifice and the trust they had to put in one another to get the job done. Never trust anyone over 30? In 1965, that would have included the millions of men and women who helped defeat the Nazis in Europe and the imperial Japanese in Asia. Even if he didn’t really mean it, as Weinberg has been reported to have said since, it became a touchstone line of the ’60s generation growing old. How arrogant that seems these nearly five decades later. So what is there to learn? That nothing is static, that no challenge is truly new, that any proclamation on its face, however popular or pithy, is best judged over time. We learn that conflict and friction is part of the human experience, and that wisdom is not a generational birthright. The Boomers turned 30, saw writ large our own character and judgment flaws in the presidents of our generation – Bill Clinton and George W. Bush – reveled in the Me Decade and the tech boom that empowers the individual. But, despite the Beatles’ plea, came together only in the most horrific moments, like 9/11. Turns out we didn’t trust each other. That same spring of 1965, the Who’s Pete Townshend wrote the lyrics to “My Generation,” on his 20th birthday. His line, “hope I die before I get old” became a musical catch phrase of my generation. He’ll be 69 on Monday. Sandy Johnson will be back next week. She is a journalist and a gardener, equally passionate about both. She lives in Alexandria, VA. Visit her on her blog, Grassroots & Gardening.